A large and ever growing number of people suffer daily from the debilitating effects of anxiety affecting their quality of life. A majority suffers in silence. Without the appropriate tools and in their attempts to cope, they often resort to maladaptive strategies. Many find solace in the use of various substances including alcohol, cigarettes, marijuana, to mention a few. This goes on for years and years as anxiety is a life-long condition. The lack of user friendly, down to earth tools out there has been a major perpetrator of this problem. The Anxiety Protocol will undoubtedly now addresses this gap. A major strength of this book is its encouragement on the use of modern technology to enable people young and old to research and manage their ailment on line where they will learn self-help skills and alternative strategies. This is an easy to read book that offers a comprehensive, up to date and holistic exploration of the different anxiety disorders backed by the latest research and is extremely well referenced. The affiliated website AnxietyBoss.com enables those who do not have timely access to a family doctor or specialist to find out about the latest evidence-based solutions that can help them deal more effectively with their anxiety. The book contains six sections divided into 22 chapters. Each chapter is a comprehensive review in its own right. Section 1, Chapter 1 presents a general overview and classification of anxiety disorders citing a comprehensive list of symptoms to characterize each disorder. Each subsequent chapter (2-9) provides a thorough exploration of a separate anxiety disorder, illustrated by specific detailed case examples containing the presenting symptoms, full case history, diagnosis and clinical course. For each disorder there is a comprehensive list of management strategies including self-help, psychotherapy, pharmacotherapy and goes beyond the traditional treatment strategies for each disorder by expanding on a variety of natural remedies and providing research based information on a variety of herbal and nutritional products. This in itself is a unique and welcomed feature of this book making it very appealing to many. Section 1, chapter 10 provides a brief up to date account of the neurobiology of anxiety disorders to demystify misconceptions and provide a better understanding of the “chemical imbalance” in the brain usually referred to by many but only few can comprehend. Section 2 expands on the treatment of anxiety with chapter 11 focusing on the psychotherapeutic approach to anxiety disorders. The emphasis here is placed on cognitive behavioral therapy (CBT) as the first line treatment for all anxiety disorders, citing a higher level of evidence of effectiveness than any other type of psychotherapy. Chapter 12 explores the various classes of medications used to treat specific anxiety disorders and provides the reader with a helpful table listing all the medications, the type of anxiety they treat and the mechanisms of action. In this chapter the author refers to prescription medication as a “last resort treatment” reserved for the most severe cases or those who have failed psychotherapy. This may sound controversial to those who consider medication in association with or as an adjunct to psychotherapy. According to the author this statement has been explicitly written to educate, raise awareness and encourage physicians to avoid the indiscriminate use of psychotropic medications for anxiety before even trying other strategies especially CBT whose beneficial effects have also proven to be longer lasting than any medication as well as self–help and/or alternative interventions. The book is meant not only to educate about anxiety but also hopes at the same time to change the way physicians think about treatment or resort too quickly to medication. Section 3, Chapter 13 and 15 deal exclusively with alternative treatments for anxiety with a comprehensive list of practical self-help interventions. Chapter 14 covers an extensive list of various natural supplements that have proven useful in anxiety disorders. Each is described in detail backed by recent studies and placebo controlled RCTs. including positive effects, dosages and adverse effects. Section 4 provides an extensive coverage of anxiety disorders resulting from trauma and stress including adjustment disorders complete with case examples and treatment strategies. Section 5 is important as it deals specifically with anxiety disorders in special population including children (chapters 18 &19) and the elderly (chapter 20) focusing on the special criteria, clinical course and treatment of anxiety disorders in these population with well written case examples. 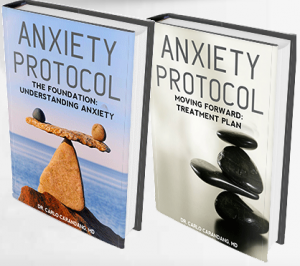 In conclusion Anxiety Protocol is a creative, innovative and comprehensive book on anxiety. The author presents his readers with a vast array of self-help skills and alternative methods of managing their anxiety including online support via its websites, AnxietyProtocol.com and AnxietyBoss.com. This is quite unique and in keeping with the type of treatment that people usually aspire to but have not been able to access so far. Anxiety Protocol has broken the ice and now makes it easily and readily accessible. A weakness of the book is with regards to children namely, a lack of specificity of the disorders and specifically the ages that some of the techniques could be most helpful and that could also serve as a guide to parents and clinicians. The book’s greatest achievement is the provision of comprehensive alternate strategies including natural remedies and self-help strategies as well as the provision of an affiliated website AnxietyBoss.com to provide specific management strategies and tools putting these at easy reach of most people. The information contained in the book is well researched and referenced and aimed at those who for different reasons may not have access to a well-qualified therapist or physician or those sitting on a wait list. This book now provides hope for them and as such should be made widely available and easily accessible to the population at large as well all mental health practitioners and physicians. 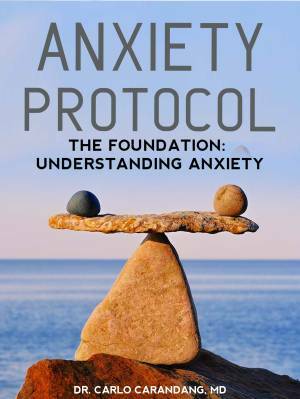 There is a lot of knowledge to be gained by reading the Anxiety Protocol. Overall this book is highly recommended as a useful resource in many different ways. 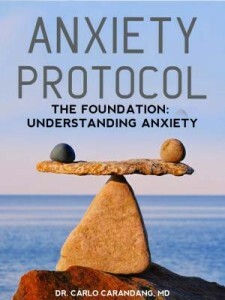 Note fro m the author, Dr. Carlo Carandang: Dr. Sheik Hosenbocus kindly reviewed the 1st book of Anxiety Protocol, The Foundation: Understanding Anxiety, but did not review the 2nd book of Anxiety Protocol, Moving Forward: Treatment Plan, as the 2nd book was not completed at the time of his review. The 2nd book, Anxiety Protocol, Moving Forward: Treatment Plan, is a concise yet comprehensive, 8-chapter self-help course designed to help you eradicate your anxiety quickly, while the 1st book of Anxiety Protocol, The Foundation: Understanding Anxiety, is a comprehensive reference for increasing your knowledge of everything related to anxiety. Carlo Carandang MD is a psychiatrist with over 15 years of clinical experience treating patients with psychiatric disorders. His areas of interest include anxiety, depression, and psychosis. Dr. Carlo is a productive researcher and scholar, and to date has 34 publications and 6 research grants. Dr. Carlo has been on the medical staff of numerous hospitals, and was on the faculty at two prestigious medical schools.